A full size sedan should be special, and a luxury model should impress you. From the exterior to the interior, you want your new vehicle to be special. The Chrysler 300 offers excellent exterior features to impress you, and this popular vehicle will help you feel good when you are driving around town. When the weather is not totally clear and there is fog that is messing with your view of the road, you want your vehicle to have good fog lights in place to help you see. The Chrysler 300 is set up with premium LED fog lamps. Prepare to be impressed by the Jeep Gladiator. Scheduled to roll out in the spring of 2019, this all-new midsize pickup truck is sure to delight drivers with its impressive capability features and innovative design. The Gladiator enthusiast at Laurel Chrysler Dodge Jeep Ram cannot wait to introduce you to this powerful and stylish vehicle. As the only open-air pickup in the industry, the Gladiator gives you a variety of ways to bring the beauty of the great outdoors into the interior of this truck. Chrysler, Dodge, Jeep and Ram has a superb Certified Pre-Owned Vehicle (CPOV) program whose certification process results in premium quality late models that look and ride like new. We here at Laurel Chrysler Dodge Jeep Ram can't stop discussing the program's many benefits. Following are two benefits we especially like. Under the CPOV program, you receive a car rental allowance up to $35 daily in the event your CPOV is inoperable due to failure of a covered component or indisposed for overnight repairs. The Jeep Renegade is one of the best SUVs on the market. At Laurel Chrysler Dodge Jeep Ram, many of our consumers choose this model because it comes equipped with a number of innovative features. These include capability features that offer exceptional efficiency and performance. Let's check out some of its capability features. The Selec-Terrain Traction Management System is featured on Renegade models with 4x4 systems. This system increases capability with four drive modes that include Auto, Mud, Sand, and Snow. Some vehicles are simply made to get you to wherever you want to go. This leads to a feeling of confidence and peace of mind when you no longer have to ask yourself, "Can I go there?" The 2018 Jeep Wrangler was built to bring this peace of mind to all who sit behind the wheel. Not all SUVs have to be gas guzzlers. Dodge has proved this sentiment with its new Durango. This popular mid-size SUV exhibits a bevy of fuel efficiency features designed to save you money at the pump while also delivering a great service to the environment. You will feel good about the savings as you ride around in style. The Chrysler 300 features a suite of smart technologies that enhance both your driving experience and overall safety on the road. These advanced technologies continue to push the limits in automotive design as Chrysler continues to remain on the cutting edge of innovation. You'll feel like a smarter driver the minute you leave the curve with Chrysler's Uconnect 4C infotainment center. It has a large 8.4-in touchscreen, integrates with Apple's CarPlay and Android Auto, and can be controlled with voice commands. Which Truck Liner is Right for Your Needs? Understanding the differences between truck liners can let you choose the one that suits your hauling needs. A drop-in liner is better for those needing to move heavy loads in and out of the truck bed regularly. On the other hand, a spray-in liner is great when you want to ensure that the objects in your truck bed stay put as you drive. At Laurel Chrysler Dodge Jeep Ram, the Jeep Wrangler is a popular compact SUV among our customers because of all the amenities it has to offer. The Wrangler's price starts at $27,945 and is offered in five trims that include the MOAB, Rubicon, Sahara, Sport, and Sport S. Let's take a look at its safety features below. Do you make deliveries? 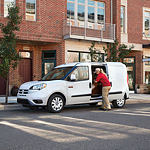 At Laurel Chrysler Dodge Jeep Ram, we see entrepreneurs who deliver goods for their small businesses, contractors who drive their professional tools to their work sites, little league coaches who need to bring gear to games and families who simply require a multipurpose vehicle like the Ram ProMaster City. Today, we want to highlight this transit van's durability.